Exuding understated elegance, style and glamour, the Anassa languishes on the long sandy beach at Latchi; here you can be assured of all the luxuries and attention to detail that comes from a hotel that is part of the ‘Leading Hotels of the World’ group. 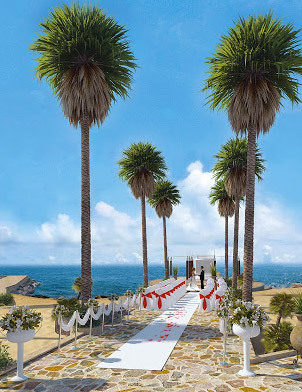 For your wedding ceremony there are several options – the picturesque chapel in the hotel’s grounds and even the opportunity to have a civil wedding on the beach, followed by a BBQ reception. The Biggest Day of Your Life at the Luxurious Anassa Hotel..
Glistening waterfalls link Anassa’s two spectacular swimming pools, just steps from some of the finest luxury watersports facilities in Cyprus. Dive, sail and windsurf in the beautiful waters of the Akamas Marine Reserve...or venture into the wilds of the proposed Akamas Nature Reserve for jeep safaris, rock-climbing, mountain-biking and hill-trekking. Tennis and squash are available on site, along with beach barbecues, traditional Cypriot evenings and a weekly Cyprus Fair – or choose from four 18-hole championship golf courses within an hour’s drive. The Anassa is a beautiful contemporary hotel and believes in the concept of a simple and classic design combined with world class service creating the perfect atmosphere for any honeymoon couple.